Running on the success of Days Of Future Past, 1968 saw The Moody Blues record their second album with Deram Records. In my mind they were still very much in the exploration phase musically, just like Days Of Future Past this album contains many different directions. Many people view Days Of Future Past as being SGT Pepperish in parts, personally I think I see that Psychedelic influence more in this album. In some ways I guess I’d say this is a bit of a concept album, out is the full blown orchestra, but in are some unusual instruments, the Oboe, and Cello. The most unique instrument though is the Mellotron. Whats a Mellotron I hear you ask? It was the staple of the Prog Rock movement before the magical inventor Robert Moog hit the scene with the Moog Synthesizer. Having talked to a couple of Mellotron users, Rick Wakeman and Keith Emerson, it apparently was an absolute beast to deal with. The cover notes for In Search Of The Lost Chord refer to it as an ‘unwieldy instrument’, my unnamed sources (Rick and Keith) call it names that a family site like this could not possibly publish! Using tape loops you could create an orchestral sound, but needed the help of some pretty damn good technicians. I really liked track 9 Visions Of Paradise, and unless I am very much mistaken, yet another unique instrument comes into play, the Sitar. The final track Om is right out of the ‘eastern musical’ playbook, again the Sitar plays a part, and the chant of ‘Om’ justs adds to it. Youthful playfulness, I’ll put that down to. Actually this track would be a big hit with the ‘New Agers’, my wife and I were invited to a Diva Premal concert a few months ago, this song would have fit right in. Once again this re-release is loaded with extras, out-takes, alternative versions, and some previously unreleased material. To my mind, it is the extras that are compelling. In Search Of The Lost Chord as it stands, is maybe not one of the greatest albums by this wonderful band. It did chart at #23 on Billboard, and it made it to the top 10 in their home country of England, so you can hardly ignore it. However playing in the sand box of extras included in this re-release you really start to see the direction that The Moody Blues were headed in. For anyone that likes this band, and that pretty much covers everyone who is older than 5 and 105, you will want to grab a copy. For us older folks it is a great trip down memory lane to the wonderful would of being a hippie, for the younger generation it represents an opportunity to see that being a hippie wasn’t all bad! Did you stand awhile and stare? There is lots to be learned from the music of four decades ago. Once again I have to praise UME for re-releasing and remastering this seven CD set. The audio quality is superb. You can pick up your own copy from better CD vendors everywhere, or order it online from Amazon. 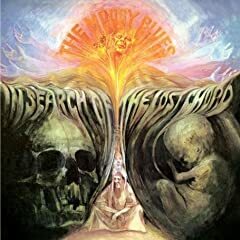 No user commented in " CD Review: In Search Of The Lost Chord by The Moody Blues "